Using your freezer to its best advantage sometimes means prepping ingredients and storing them for later use. 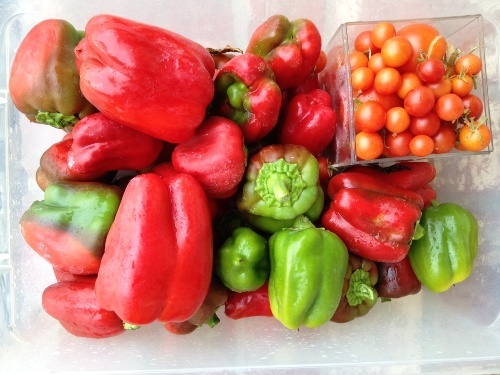 Got a glut of a vegetable, like bell peppers? Chop and freeze to use later. A few weekends ago my parents came down for a visit. My dad raided his garden before he left, bringing with him a huge box full of bell peppers and cherry tomatoes. I had also received several peppers in my produce box. I was rich in peppers! So, I did what all good freezer cooks do, I chopped and sliced them all up and quick-froze them on cookie sheets until they were hard. Then I repackaged them in quart-sized freezer bags. Now, whenever I need chopped peppers for a sauce or sliced peppers for a stir-fry, I can just grab as many as I want from the bag. Easy peasy. @Julie, yes, I can’t wait for the lemons to come in season! I do this ALL the time. They are SO easy to freeze, and I like that I can take out as much as I need for a meal later. Can you freeze the tomatoes like that too? Or will they be disgusting if defrosted? I have never frozen fresh tomatoes, so I can’t speak directly to that. I either dehydrate them or cook them before freezing, though I’ve heard of others who have frozen them fresh. There is a definite texture change, though. There are some vegetables that need to be blanched prior to freezing, like corn or beans. There are others, like peppers and onions, that can be quick frozen like I describe here. I freeze roma tomatoes whole. I just wash them, take the core out and put them in gallon freezer bags. They work great for soups and sauces. I bought a bushel of peppers from my local farmer earlier this summer and froze them. It was a lot of chopping, but I love having them available all winter long. I have never frozen peppers in this way (going to start tonight though), but I always freeze the tomatoes that are starting to get a bit squishy (the ones that are still fine but not nice enough to eat in salads or sandwiches) and use them to make roast tomato sauce for pasta … it’s amazing how quickly you collect enough for a meal! I like this idea of flash freezing so they don’t stick together.